After having a baby, shopping is just not the same anymore. Going to the store and leisurely shopping the way I used to is not easy. But last weekend I decided to face my fears of shopping with an infant and just do it. We ended up having a nice little Sunday afternoon out bargain shopping (Jack slept the entire time of course). I ended up at my favorite store of the moment... Nordstrom Rack. I still had $25 on a Nordstrom gift card from Christmas, and when I get a gift card, you know I'm going to make the most of it and stretch the money as far as I can. Since I'm trying really hard to be disciplined with my spending habits, I tried to stick to my spring/summer wish list that I made a few weeks ago (post here). This way I was able to remember the things that I really wanted and not get side tracked. I've been wanting a new pair of jeans for the longest time. This might sound crazy coming from someone with a closet full of jeans, but you can never have enough denim. I had something specific in mind. I wanted to find a pair of jeans with a thin stretchy material that would be nice and light for the warmer weather, and also had a distress faded look to them. I ended up settling on a pair of jeans with no holes and a thicker material. They were only $12.97 and they fit well. I felt that I couldn't beat the price so I bought them. Once I got them home, I tried them on and realized I had made a mistake. Despite the great price and fit, they were not the jeans that I was looking for. So later in the week I made a quick trip back to Nordstrom Rack to return them. 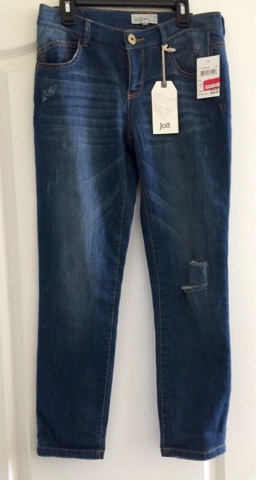 While I was skimming through the clearance racks I stumbled upon this pair of jeans for $13.50. I was so excited because they weren't there earlier in the week and they were just what I was looking for, including the price. I was very satisfied with my exchange. 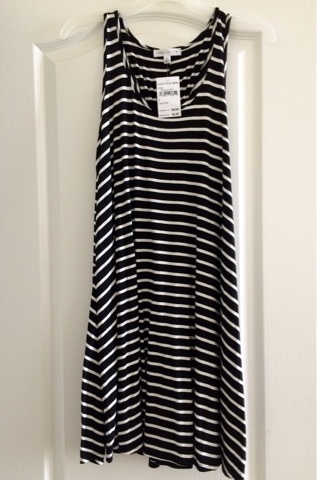 My other Nordstrom Rack purchase was this striped swing dress that I bought for $18.97. Now I know on my shopping list I was looking for a bright spring color dress. I'm still searching for one, but I thought that this dress was a safe bet for me. I love black and white and I love stripes. I figured that I would bring some color to it with a fun necklace. This style of dress will be perfect for the hot desert summer that we have here in Las Vegas. My last purchase was from Target and it came straight from my shopping list. 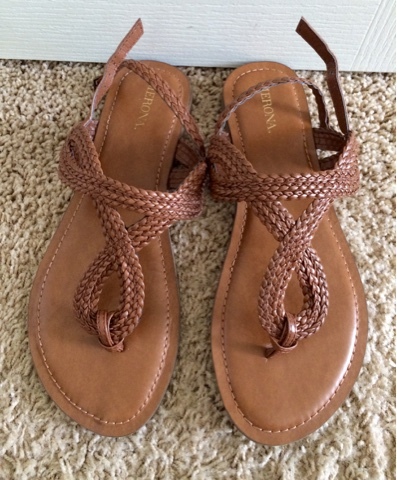 I was looking for a pair of braided sandals to replace my white braided sandals that I bought at Target years ago. I ended up pretty much buying the same pair in the cognac color. I paid full price, but they were only $15.99, so I wasn't sad about that. Target is one of my favorite places to buy shoes, because their shoes are always affordable and they are made well for cheap shoes. I know that I will get plenty of use out of these sandals. Whenever I get new clothes I love to put together new outfits and share them. So here are a couple looks I came up with. Here I put together 2 looks with my new jeans. On the left I have a casual look with my new sandals. On the right I put together a dressier outfit with a blazer and heals. Here are 2 outfits with my swing dress. The first look on the left is simple and perfect for the hot summer weather. On the right I wore my wedge strappy sandals with my denim jacket to dress it up a bit more. I hope you like my shopping finds. Hopefully you can find some great spring deals too! Happy shopping!